Forgotten Fields aims to become more Sociable! (from the point of view of funding) and the loose ends are tidied, we have a new aim; to communicate the research more widely. Last night we had the follow up session to our Social Media training with Ally Fogg and Forgotten Fields has voluntarily, but with trepidation, joined Twitter. One event to look out for is the launch, at the Manchester Histories Festival (21st-30th March), of the Forgotten Fields website which we are now concentrating on updating and improving. Forgotten Fields has a stall at the Manchester Histories Celebration Day in the Town Hall on Saturday, March 29th where we will be showing all our previous work and officially launching the Forgotten Fields website. 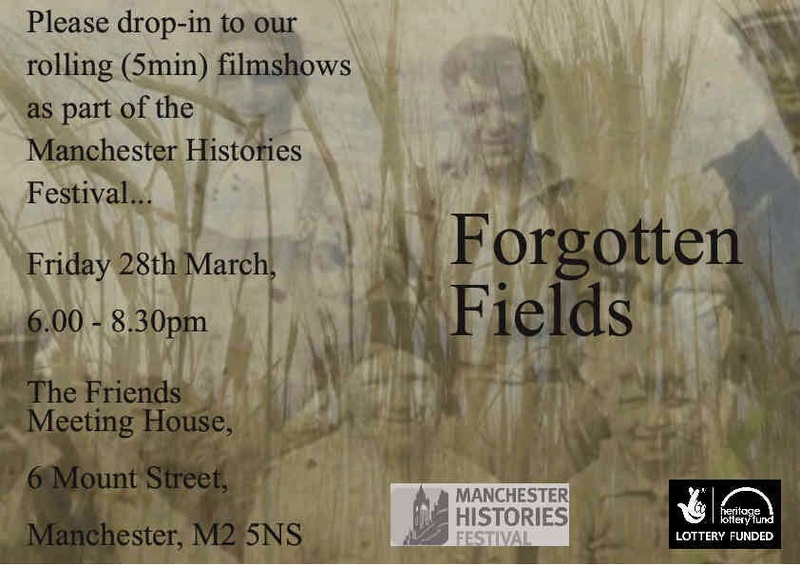 The small films made as part of this project by Charlotte Dean and the previous Forgotten Fields documentary film made by Abi McLoughlin will also be shown as part of the festival on the evening of Friday 28th March at the Friends Meeting House. Click on the twitter symbol below for our tweets. Oral History with children of Local Primary School at Dunham Massey. In addition to the performance, children of Oldfield Brow School also had a chat to Ron Hutchinson (who was born in Dunham Massey) about how he and other children used to harvest potatoes at the local farms in the school holidays. Ron was born at Brook Cottage and told horrifying (!) tales of having to go to the privvy on cold wet, black nights! We will transcribe the tales and put them here as soon as possible. Many thanks too to Gina who brought along her collection of local photos...which help put the stories into perspective. Year 6 children from the local Primary School have worked hard to produce a play in a day! Children travelled to the wonderful Dunham Massey Village Hall to work on the history of nightsoil and vegetables travelling 'to and fro' along the canal that runs as the end of their school playground. The pupils learned about the story of nightsoil collection from Salford and Manchester, its transportation out to the local fields as fertiliser, and the return on the same boat (!) of local crops to Potato Wharf and the City's markets. The children created the story for 'Remembering the Food Cycle' with reference to the Forgotten Fields research. Using stories of local people and places they created characters, props and the set for the play. and the potato dealer at Castlefield. Props include 'the privvy, the night-soil horse and cart, the canal-boat, the heap of night-soil, the potato dealer's barrow, the toilet bucket, and the Manchester Times, 14th April, 1849. The set included a Potato Wharf Warehouse and the Oxnoble Pub at Castlefield (named after a potato). The children wrote their own scripts and practiced crab like moves across the stage to keep their 'characters' facing the audience! Mrs T created a wonderful rhythmn piece in costume with children not on the stage. On Sunday we had an interesting morning talking to people at the Abbey Leys Farmer's Market about the availability of locally grown food for the City's markets. There was lots of interest in the role of the canal and a good deal of disgust at the thought of using the returning night-soil boat for the transport of farm food to the city! We would like to know more about the locally grown vegetables that were carried via the Bridgewater Canal from market gardeners such as Mr Jackson at Lime Tree House at Dunham Massey whose field backed onto the waterside. I'm told that his vegetables were loaded from the wooden pier there for transport into Castlefield. Making the connection with Kindling's current growing initiatives. ''My grandmother, Marjorie Coombes, (born around about 1916) lived at Greenhalls Avenue, Stockton Heath...told me that in some of the houses, (I don't know if it was hers or her neighbours).... that didn't have ginnels, the night-soil men, to get through to the back to the night soil, had to come through the house to empty the pan, to carry it back through to empty it into the cart! Concentartion in Copyright training - there's a lot to take in! Jan Hicks, Archives & Information Manager from MOSI (Museum of Science and Industry, Manchester), has given ten of us an enjoyable, clear and thought-provoking training on understanding copyright. The trainees have come from all backgrounds: volunteers for Kindling, the National Trust, and the NW Heritage Seed Library at Ordsall Hall as well as representatives from organisations such as Cheshire Garden's Trust, Dunham WI and the Wooden Canal Boat Society. How does copyright apply to paintings, drawings, photographs, maps, works of architecture and artistic craftsmanship? Management of copyright including Documentation, Licenses vs full transfer of rights, Explaining copyright to interviewees and caring for the documents,images and sound recordings. Some useful unexpected contacts were made between previously unconnected groups in the brief networking catchup at the end. Volunteers picked the last few rows of potatoes at the National Trust's Little Heath Farm, Dunham Massey. What an enjoyable and worthwhile day! Their enthusiasm for the historical context, support and engagement with the task in hand was much appreciated. Night-soil treasures were uncovered as we dug into the soil with a real sense of wonder at making the connection with this grubby but productive part of our heritage. All volunteers getting stuck in! All enjoying a day of November sunshine in beautiful surroundings.